Bye-Bye, Anxiety! Your Sedation Dentist Helps You Relax! Do shivers of fear run down your spine when you think about going to the dentist? Do you have nightmares about tiny mirrors, dental drills, and shots? If your dentist has become a boogeyman in your mind, you’re not alone. Lots of folks experience some level of dental anxiety. Your feelings might be even more intense if it’s been a few years since your last appointment and now you’re afraid you might need to have some major work done. Well, now you can relax. Your sedation dentist in Ripon can make your next visit as easy as pie! The goal of sedation dentistry is to help patients have an anxiety-free experience no matter what treatment they’re getting done. It employs various drugs to help you relax during the appointment. Nitrous oxide (laughing gas) is a popular choice because it works quickly and wears off quickly, even allowing you to drive yourself home after your appointment. If your anxiety level is high enough that nitrous oxide won’t do the trick, oral conscious sedation might be a better choice. You’ll have to take a pill shortly before your appointment. It’ll induce feelings of well-being but allow you to stay conscious so you can still respond to your dentist’s questions. It works by reducing activity in the areas of your brain that control fear and anxiety. Many patients like this type of sedation because it delivers a high level of relaxation without requiring the use of a needle. After all is said and done, you may not even remember what went on during your appointment. The drug takes several hours to wear off, so you’ll need to have someone drive you to and from the dentist’s office. This method delivers a drug right into your bloodstream. It is powerful enough to help even the most extreme cases of dental anxiety. It’s also easy for your dentist to adjust your level of sedation throughout the treatment. However, as is true of the other sedation techniques, you’ll still be responsive while you’re getting your teeth worked on. It will make you comfortable, so it will be possible for the dentist to complete more than one procedure during your appointment if necessary. Some sedation techniques are safe for patients of practically any age, including children. In addition to helping people who have dental anxiety, it is also appropriate for those who have a strong gag reflex or who have trouble sitting still. 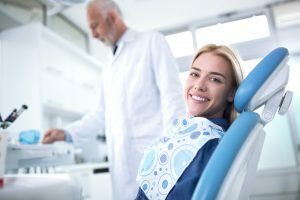 If you get the heebie jeebies when it’s time to visit your dentist, sedation dentistry might be what you need to set your fear aside and let your dentist give your smile the TLC it deserves. Our team of dentists at Silver Creek Dentistry is truly committed to providing the highest level of dental excellence to patients. We also understand that not everyone loves to get their teeth worked on, which is why we offer sedation to help you feel at ease when you’re with us. If you have questions about how we can make your experience in our office as comfortable as possible, please contact us at 920-748-7200. Comments Off on Bye-Bye, Anxiety! Your Sedation Dentist Helps You Relax!